People familiar with Japanese might recognize that Chinese Characters as meaning “large” or “big”. However, in several sects of Buddhism it means “universe”. It is burned to wish those that died in war peace in the next universe, aka the next life. Families who lost someone in the war have these lanterns made and put a wish on it or the name of someone who died in the conflict. The festival is spectacular. In a way we were lucky. All the weather forecasts predicted heavy rain, so many stayed away. It was a lot emptier than it normally is. However, despite some sprinkling here and there, it did not rain the entire time we were there. As we waited to enter, we could hear the monks wailing their prayers for the fallen to find peace. This is Toda-ji in Nara. We walked along the lanterns. Paper lanterns stacked everywhere with prayers and names written on them. 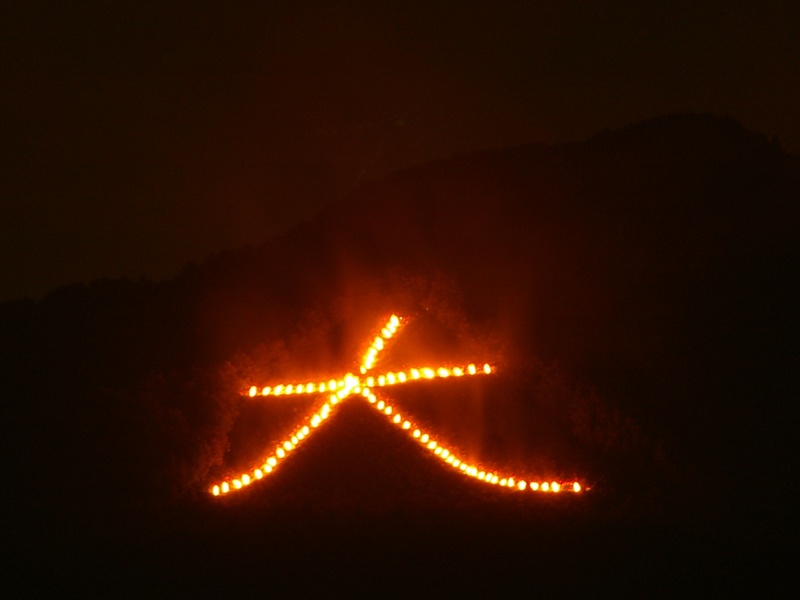 Finally, we rushed off to the viewing point for the real spectacle of the evening: the mountainside being lit on fire. This was my first time seeing this even (I’ve heard so much about this festival). We watched in awe, but failed to get any good photos. This was the best out of dozens. We bemoaned our lack of tripod. Just after the ceremony finished, a light rain started to fall. People were in awe that it had waited until it was over. My husband said the same happened last year. Whenever rain is predicted on the day of the festival, it somehow always waits until the ceremony is over. Very polite weather. What do you expect, it is Japan? Under a shared umbrella, we explored Nara and the other lit up temples and shrines. Some were quite gorgeous at night. I’m proud of this shot for some reason. My husband snapped this photo. Aw, but what is Nara without the deer? Posted on August 21, 2017 by VisitorInAStrangeLand	This entry was posted in Uncategorized and tagged Nara Fire Festival 2017. Bookmark the permalink.